Q: Chinese Vice Foreign Minister and the Chinese Government's Special Representative for the Korean Peninsula Affairs Kong Xuanyou visited the DPRK today. What topics will be discussed? A: As close neighbors, China and the DPRK maintain normal exchanges. We will release the information on important exchanges in a timely manner if there is any. You may keep following that. Q: Will the Chinese government give regulatory approval for the takeover by the US company Qualcomm of the Dutch company NXP? I am aware this is not a question for the foreign ministry, but no other government departments will take questions on this. A: I would refer you to the competent authority for specific information. What I can say is that Qualcomm and NXP are well-known international semiconductor enterprises. Qualcomm's deal to acquire NXP will exert far-reaching influence on the global semiconductor industry. The relevant Chinese department is reviewing the takeover in accordance with the Anti-Monopoly Law. During this process, the relevant Chinese department has maintained sound communication with Qualcomm. Q: American Airlines and Delta Airlines have both removed references to Taiwan as a country on the website. But they have not gone so far to say "Taiwan, China" like other airlines. Is the Chinese government satisfied with this approach? A: We noted that some positive developments have taken place and acknowledge the corrections made by relevant foreign airlines. China is willing to share development opportunities with foreign enterprises and they are welcome to invest and operate in China. In the meantime, we also hope that when doing business in China, they will respect China's laws and regulations and sovereignty and territorial integrity, and respect the Chinese people's feelings. Indeed, we will ensure their lawful rights and interests in accordance with the law and create a level playing field for them to do business in China. Q: We noted that President Xi Jinping just paid a state visit to South Africa. Do you have more details about this visit? How does China look at the prospect of China-South Africa relations in the future? What consensus has been reached by the two leaders on advancing the cooperation between the two countries? A: This is the third state visit President Xi Jinping paid to South Africa. Such high frequency of visit fully showcases the great importance China attaches to its relations with South Africa and its strong will to deepen cooperation with it. This year marks the 20th anniversary of the establishment of diplomatic ties between China and South Africa. Over the past 20 years, the two countries have been supporting and learning from each other while exploring a development path that suits our respective national conditions. In just 20 years, the relationship between the two countries has been elevated from partnership to strategic partnership and then comprehensive strategic partnership, which is rare in China's bilateral exchanges with other countries. When in South Africa, President Xi Jinping held a meeting with President Cyril Ramaphosa and attended commemorative activities in celebration of the 20th anniversary of diplomatic relations. The leaders of the two countries reached important consensus on advancing the China-South Africa comprehensive strategic partnership in the new era, and agreed to strengthen high-level exchanges, deepen mutual political trust, synergize development strategies, promote practical cooperation, conduct more frequent people to people exchange, step up multilateral coordination, and jointly uphold multilateralism and oppose unilateralism and protectionism. The leaders of the two countries also agreed to enhance cooperation within the framework of the Belt and Road Initiative and the Forum on China-Africa Cooperation (FOCAC), deepen exchanges and cooperation in new economic areas and emerging industries, share opportunities presented by the fourth round of industrial revolution and make sure the people of the two countries will enjoy the outcomes of China-South Africa cooperation. During the visit, the two sides signed a series of bilateral cooperation documents. It it worth mentioning that the 10th BRICS Summit will soon be held in Johannesburg, South Africa. In September, the FOCAC summit is set to take place in Beijing. Since early this year, China and South Africa have been supporting and closely cooperating with each other on these two grand diplomatic events. We have made joint efforts to ensure the full success of these two major events, which will surely achieve the outcomes as expected. So to speak, China-South Africa relations have set an example for China-Africa relations, South-South cooperation and the solidarity and cooperation between emerging markets, and are also exemplary to forging a closer China-Africa community with a shared future and building a new type of international relations featuring mutual respect, justice and fairness and win-win cooperation. Q: The Laos state news agency says that several people were dead and hundreds were missing after a hydroelectric dam collapsed in Attapeu province in southern Laos on July 23. The water also left many homeless. Will China offer any assistance in dealing with the disaster? Is there any Chinese killed or injured? A: We express deep condolences for the casualties and property losses caused by the dam break in the Laos and deeply mourn for the victims. We hope that those missing will be rescued as soon as possible, the injured will recover speedily and people in the affected area will return to normal life and work at an early date. China is ready to support and assist in the Laos's disaster relief efforts in a timely manner. We are in close communication with the Laos in this respect. According to the initial information from the Chinese Embassy in the Laos, no casualty of Chinese citizens has been reported by far. 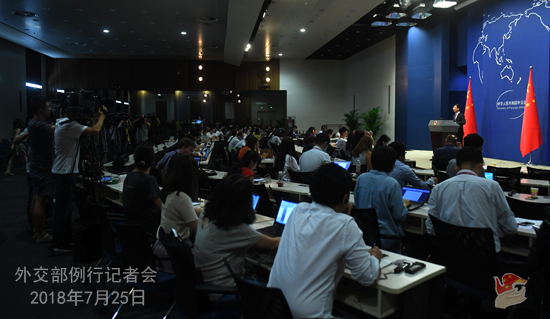 Q: The US Congress has reached a compromise on the draft bill of National Defense Authorization Act for Fiscal Year 2019 that includes several propositions aimed at China, like strengthening defense ties with Taiwan and studying China's "coercive activities" in the South China Sea. What is your response to this? A: The Chinese side expresses strong dissatisfaction with and firm opposition to the China-related provisions in the above-mentioned bill and has lodged stern representations with the US side on many occasions. If the relevant content passes into law, it will severely undermine the mutual trust between China and the US and jeopardize our exchanges and communication in relevant fields as well as cross-straits peace and stability. We urge the US side to discard the outdated cold-war and zero-sum mentality, immediately delete the relevant negative content and uphold rather than disrupt the steady development of the relations between the two countries. Q: Wildfires near Greek capital Athens have killed 74 and injured 187, leaving at least 20 missing. What's your comment? Has any casualty of Chinese citizens been reported? A: The severe wildfires in Greece have caused major casualties and property losses. The Chinese side sends deep condolences to the victims and expresses sincere sympathies to the bereaved families and the injured. The Chinese Embassy in Greece is now in close communication with relevant Greek departments. As verified, no Chinese citizen has been killed or injured so far. Q: The DPRK has been strongly requiring the US to declare the end of the Korean War. The anniversary for the armistice is coming on Friday. Do you believe China should join the declaration of the end of the war? Do you think the DPRK, the ROK and the US can declare the end of the war without China? A: Ending the war state on the Korean Peninsula and replacing the armistice with a peace regime are an important part of the political settlement of the Korean Peninsula issue and the shared aspiration of the international community. China supports all parties' efforts to this end. As an important party to the Korean Peninsula issue and a signatory to the Korean War Armistice Agreement, China will play its role in this regard. Q: The East Asian Olympic Committee (EAOC) revoked Taichung city's right to host the East Asian Youth Games in 2019. Spokesperson of the US Department of State said that it supports Taiwan's participation in international organizations whose members are not restricted to countries, and that the mainland and Taiwan should have productive talks as soon as possible to avoid escalation of tension. What's your reaction to that? A: The Spokesperson of the Taiwan Affairs Office of the State Council already made an elaborate response to this issue of the EAOC revoking Taichung city's right to host the East Asian Youth Games in 2019. 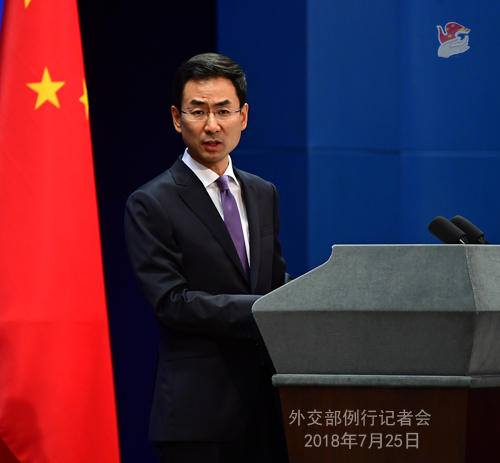 Regarding the remarks by the US Department of State, I shall say that the one-China principle is the universal consensus of the international community and adhering to the principle is the political foundation for the steady development of China-US relations. We urge the US side to comply with the one-China principle and the three China-US joint communiques and properly handle relevant Taiwan-related issues. Q: Today is the deadline for the foreign airlines to change the way they label Taiwan on their websites. What consequences will they face if they don't change their websites? A: Like I just said, we noted that some positive developments have taken place in this regard and we acknowledge the corrections made by relevant foreign airlines. I also stressed that for foreign companies operating in China, they should respect China's laws and regulations as well as its sovereignty and territorial integrity, and respect the Chinese people's feelings. Q: Does China plan on being involved in any potential four-way talks between the DPRK, the ROK, the US and presumably China about reaching a lasting peace regime for the war status on the Korean Peninsula? Does China believe that a peace regime should come before denuclearization or only come after denuclearization? A: As I just said, as an important party to the Korean Peninsula issue and a signatory to the Korean War Armistice Agreement, China will play its role in ending the war state and replacing the armistice with a peace regime on the Korean Peninsula. Q: The US administration announced yesterday that it would offer US$12 billion in subsidies to US farmers to help them offset the impact of the trade war with China. Do you have any comment on this? A: You may refer to the Commerce Ministry for the specific response. First, as we said many times before, there is no winner in a trade war. The US will only hurt both itself and others when it willfully ignites the trade war. Second, we hope the US side will heed the rational voices from various sectors at home and the call from the international community, get a clear understanding of the situation and think about its gains and loses, and stop drifting further down the wrong path. 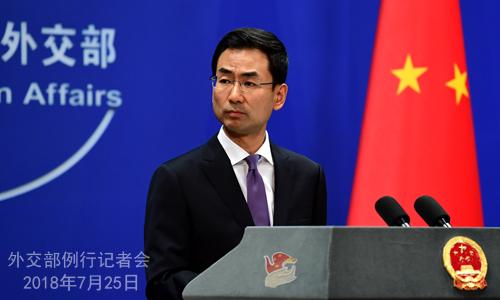 Q: Regarding the Civil Aviation Administration of China's demand that foreign airlines should change their reference to Taiwan, the US Embassy in China said it opposed China's attempt to force private businesses into using certain terms with political implications. What' your response? A: We already stated our position many times these two days. Adhering to the one-China principle is the political foundation for the steady development of China-US relations. We hope the US government will urge the relevant enterprises to comply with the one-China principle rather than put a drag on that. Q: You just said many foreign airlines have changed the way Taiwan is labeled on their websites. Are there any airlines at the moment which in the Chinese government's view are not in keeping with the way that you would have them referred to Taiwan? A: It was the Chinese competent authority that issued a notice asking foreign airlines to correct their websites. So I will refer you to the competent authority if you are interested in knowing how changes should be made on their references to Taiwan.